A hermit crab's shell is more than his house; it protects his soft abdomen and helps him maintain a proper humidity level. It's a big deal if a crab decides to give up his shell. Often it's because he's decided to trade shells, but sometimes a crab will have more serious reasons to abandon his home. A growing hermit crab will eventually need a new shell when his old home becomes a bit too snug. A good crabitat will offer its occupants a nice variety of sizes and styles of shells, so when the time comes for a change there's ample selection. Sometimes, however, Hermie will set his sights on a fellow crab's shell, resulting in a shell fight. 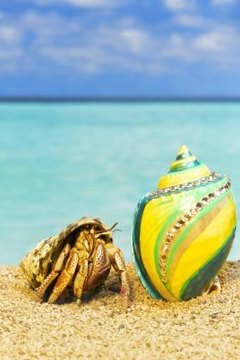 The homeless crab can be left without a shell if he can't find a suitable replacement. In other cases, a crab may abandon his shell while he's still scoping out suitable living arrangements. It could be that some sort of pest has crawled in Hermie's shell and bugged him to the point of abandoning his home. Fungus can also irritate a crab enough to force him to leave his shell. Try boiling his shell in dechlorinated water and then give it a good shake to see if it will loosen up potential irritants. Just as we shed coats and sweaters when we get too warm, a crab will shed his shell if he gets a bit too toasty. The ideal crabitat temperature is 75 degrees. If it's too dry in the crabitat, Hermie may feel as though he's suffocating and take a break from his shell. Too much humidity can also make it difficult for him to breathe, and he'll leave home to give his gills a break. Keep the humidity gauge away from water sources that may affect the reading; close to the substrate in the middle of the tank is a good location. Hermie will be happiest with a humidity level between 70 and 80 percent. Wash your hands before you help Hermie move back home and prepare an isolation tank with the proper humidity and temperature level. Using dechlorinated water, wash off any substrate clinging to your naked crab and rinse his old shell. Put them both in a clean glass cup, put the cup in the isolation tank and leave him be. He won't be able to abandon his shell or run away in panic, plus he'll conserve energy. If this method doesn't work, try to gently curl his abdomen into the shell. If he resists, give him a very light tap on his head to scare him into his shell. If Hermie won't go home, try a different shell that's the same size or a touch bigger. Never attempt to force him into a shell that's too small or uncomfortable, which can be dangerous for him. Hermit Crab Association: Help! My Crab is Naked!! Crabstreet Journal: Help! My Hermit Crab Has Left Its Shell! What Do I Do?